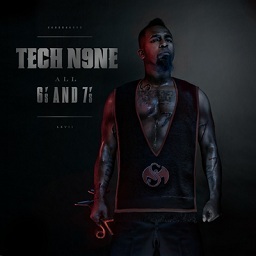 Fans received a huge surprise this past weekend when the first official track from Tech N9ne’s All 6’s And 7’s leaked online. The brand new track, “I Love Music“, features Oobergeek and Kendrick Lamar. The funky and very organic production is an unusual departure from Tech’s signature sound. Krizz Kaliko drops in to build slamming hook with his beastly vocal chops. “I Love Music” drives home the point that All 6’s And 7’s really will be the most diverse Tech album, and quite possibly the most diverse hip hop album to date. The leak caught everyone by surprise, including Tech N9ne himself. In response to the leak, Tech hit his fans over Twitter to explain the unexpected leak of the single. With June almost here, All 6’s And 7’s is closer than ever, and “I Love Music” reminds us of the monster record still ahead. Click here to listen to “I Love Music”. Click here to pre-order All 6’s And 7’s. What do you think of “I Love Music” ? Leave your thoughts below!